A social entrepreneur, Marguerite Chandler has founded more than ten non-profit organizations including the Food Bank Network of Somerset County, the Heritage Trail Association, the PeopleCare Center, Crossroads of the American Revolution, Celebrate NJ, and the south Jersey chapter of Slow Food USA. Marguerite was a Peace Corps Volunteer in Guatemala (1966-68) and volunteered with the Missionaries of Charity (1981) in Calcutta, India. She has received many awards, being named "Person of the Decade in 1989" by the Courier News, listed in "Who's Who 2002 Business Leaders" by Business News New Jersey, and chosen as a NAWBO "Woman of Inspiration" in 2006. Marguerite Chandler has a master's degree from the Graduate School of Political Management at George Washington University. In 1990, she ran for US Congress in NJ's 12th District. In her business career, Marguerite was a tax accountant, had her own human relations training and consulting business, ran a large industrial park in Central Jersey for 25 years, and was a certified Life Coach. She has chaired several major capital campaigns and created many successful fundraising events. She's married to Richmond Shreve, longtime OpEdNews contributor, and they live in Newtown, PA and Cape May, NJ. 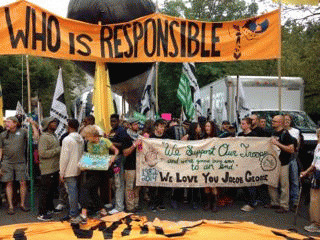 Peace Imagined: The March OEN member Marguerite Chandler's first person report of her experiences marching with fellow Quaker Nancy Strong captures the emotion and excitement of being part of the 9/21 Peoples Climate March in Manhattan. If you couldn't be there, you'll want to read this to get the inside view of what the marchers saw and felt. It was an inspiring day, and this article illustrates how those who participate bond and are uplifted. Common Bound: Moving Together Towards a New Economy This is the spirit of Common Bound, a 2-day conference in Boston sponsored by New Economy Coalition, a movement of movements, 115 organizations, 650 participants. We came here to share our hard-earned wisdom, seek collaborations, create new possibilities, eager to learn from one another. "He's a Terrible President" A couple of my progressive friends have been sending me samples of the outraged emails they receive critical of Obama and the administration. Finally, I'd heard enough and wrote back. Here is what I said.